Golly, where does the time go? This is my older class being taught by volunteers from the states and Canada. We are so excited for some very good reasons as we watch the Lord work here. 1) Little Fatima has had her second operation and she can now eat properly. Thank you, Doctor Saldana & Pamela Thompson. 2) Faye and I are very encouraged with the children at Casa Hogar. In Faye's class the children who I will receive in the future are learning classroom discipline i.e. sitting in their chairs and then at a table. They love to sing and have learned not only little childhood ditties but also Christian songs praising Jesus. Remember Faye has the 3 to 5 year olds which takes a lot of patience but it is so very important to instill proper classroom behavior. 3) My children ages 5 to 15 years old have really started to accelerate in English. They are now writing small sentences using "I can ___, I want____, I like____, & I have___. Even the Directora Aurora listens in and is attempting to learn English. But I couldn't do it without the help of my little high school helper Orley. She is one of a pair of beautiful twin teenagers whose mother works on the staff. 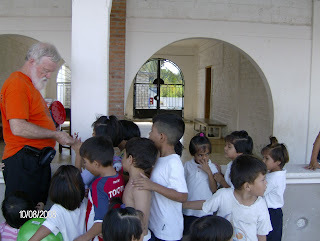 Orley goes to school in the afternoon but loves to help me with the kids at the orphanage. Her sister Itzel helps when they have school holidays. We have started getting a few American & Canadian helpers which really allows me to work individually with the newer children. Michael from Los Angeles on vacation spent two weeks with us helping little Luis and Bobby one on one. And Darlene a retired stewardess for Alaska Airlines helped Faye last week and will help me tomorrow. She has retired to PV and we look forward to her and others on vacation assisting the children learn English. Then we had Wil & Kathy and their son Brett join us and help teach this week also. 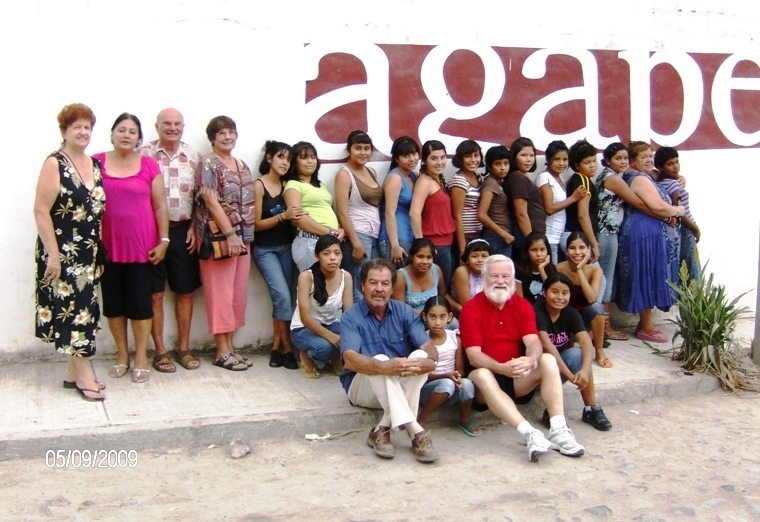 AGAPE: Most of the girls are in a Christian school and are progressing nicely. But I am amazed at human nature on its darkest side. We have two girls just placed at AGAPE by DIF (Social Services). Julia is 20 years old & Christina is 14 years old and are sisters born into a narco drug family and abused sexually since the age of 3 years old. It just tears our hearts out. Julie is so traumatized she can not longer speak and has a lot of hatred held within her. They are getting her professional counseling and plus with the loving nature of the AGAPE home we are starting to see some small sparks of change. Just like the states, times are tough here and we are seeing more and more folks coming to our church on Sunday for a hot meal. I even have had a lady begging at my door to do housework and then she tried to sell me her cellphone. I am sure that when we are in the dump at Christmas the line will be much longer than last year and we had about 2,500 to 3,000 in line for handouts. Please remember to start storing up items for the Christmas give-a-way. Items such as can goods, clothes, shoes, toys etc. I am so bad about posting on this blog. 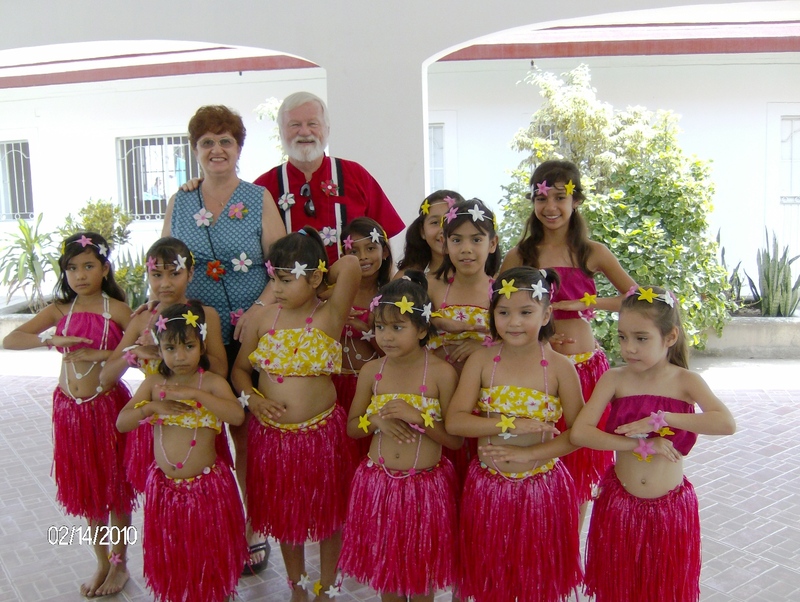 Well 2011 was a very busy year and we are now in 2012 and are seeing wonderful results with the children at both Casa Hogar Orphanage & AGAPE Home for Abused Girls. The children in my class (13) are starting to use the English they have been taught. The other day one of the 6 year old said "Dennis, please come here please." in perfect English. Of course, once the others saw me go directly to the girls it has now become a popular sentence. Hehe. We have seen so many wonderful changes in all the children but are continually faced with very terrible stories of abuse. Faye & I see our main reason for being in both locations is to show each child Jesus love. AGAPE has now signed a 30 year lease for a boys home and we are starting to collect furniture, pots and pans etc. I am also seeking sponsors who can afford $10 per month to maintain a child's needs. This will be one of the first boys homes in Puerto Vallarta and there is a great need. The boys & girls are placed in all the facilities by DIF (Social Services). They are either found living on the streets under bridges begging for food, or have run away or thrown out of the homes because a boyfriend doesn't want to provide for them i.e. to many mouths to feed or a parent has physically abused them in some way. AGAPE has now placed two girls into college, Marisa & Rebecca and we are so proud of them. We have now even started an neighborhood outreach at AGAPE where the children are taught an hour of English and then an hour of a bible story or scripture. We have employed two of our native Christian sisters in Christ, Lulu and Maria to help us. Faye and I want to thank the many volunteers we get each year to help at Casa Hogar Orphanage. They are the main reason for the success of the teaching of English. Because there are always new children to teach it forces me to neglect the other children if I don't have volunteers for the newcomers. 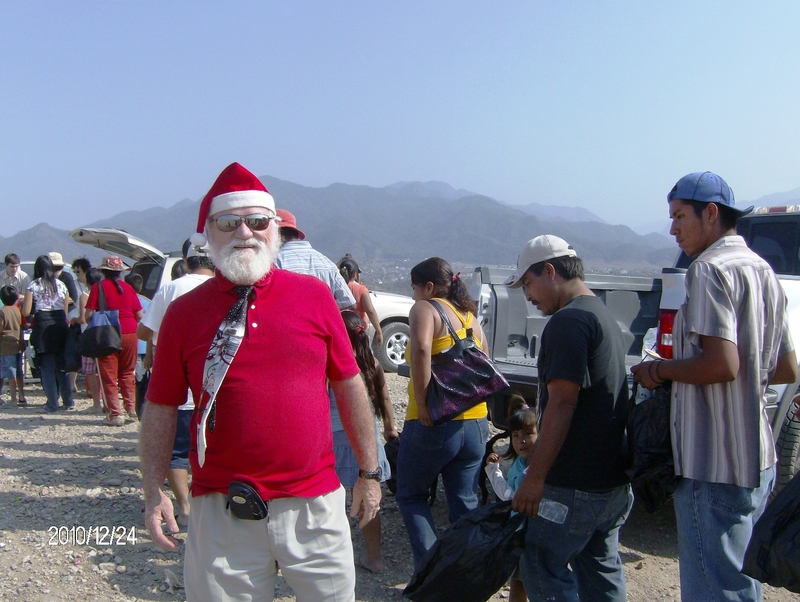 Our volunteers come from Canada, Mexico & the United States. We get individual, couples and church teams looking to bless the kids. We have folks coming on vacation and spending an hour with us and they are forever changed. I encourage you to bring your children so they can not only react with our children but also see how wonderful the life is that their own parents are providing for them. They will come away with a new realization of life in other countries and an appreciation of their own. Encourage your church mission teams to contact us and the Lord will provide them with information that may well change the lives of all who visit the orphanage & the AGAPE Home for Abused Girls. Even after 8 years the Lord continues to not only bless His Will, His Way Ministries but also continues to grow us as well. No promises but I will try to post more often. One of our sponsors has also purchased an IPad 2 for the ministry so I can now started taking video's. Then I only have to figure out how to download them and send them. Maybe I can find a two year old to teach me how to do that as I am afraid I was born 40 years to late. Hehe. God bless. It was a great week as our children both at AGAPE and Casa Hogar are starting to use their English word bingo games and also the sentences to further their abilities. They have moved little Fatima into the nursery area so she doesn't accidentally get hit in the mouth while playing. So when I walked into the nursery she was playing or helping the staff with the little babies. Bu I could tell her little mouth operation was uncomfortable as she was not her bubbly self. But upon seeing me she flew across the room into my arms. (tears). I always tear up because of the horrendous thought of someone intentionally burning little Fatima at age 3. But once again thank you Doctor Saldano as we know soon Fatima will be just like any other adorable loved 4 year old. But today I had my older children 6 to 14 years old do two sentences using " I can" and "I want". I giggled because I think everyone of the children when filling in the blank said "I want ice cream". Hehe. The level of skills are very different among the children. Some girls are brand new like Lupita ((5) & Amelda (6) and never have been to school. But some of my children are very bright. Today Elena (11) was the first to complete the wok and it was absolutely perfect. She has been one of the children that had attitude and demeanor problems. But because of the constant love and uplifting praise we shower on all the children they slowly come out of their shells. Even Maria (14) who has many emotional problems and has been shipped from the orphanage to AGAPE and then back to the orphanage again is making slow but beneficial progress. Of course as a teacher I have my favorites such as my two different Kimberly's. One I have had for three years and the older Kimberly for just a few months. It is interesting that both Kimberly's one I call big Kimberley (8) and small Kimberly (6) are two of the brightest children and also the most polite and sweet personalities. I am blessed by an assistant named Orley which is a high school teenager whose mom is on staff at the orphanage. Orley & Itzel are twins and they are gorgeous & bright and also are learning English in their schools. So helping me helps them. I will add some pictures as soon as I figure out the process. Thanks for your comments & prayers for the children. What a great week. Not only are we almost completely cured from our cough's but now no runny nose etc. Faye is completely healed and I have a slight cough (almost gone). The reason the week was so good was the children at Casa Hogar Orphanage are really starting to pick up English. I wrote a bunch of English words on the white board and various members of the class could tell me in Spanish what they meant. Wow, they didn't forget in our absence. There is hope. Hehe. Now if only their old teacher could remember the Spanish as easily. Hehe. I have started them on their first sentence i.e. "I can". I then put a bunch of action verbs on the board in English and they filled in the blank for five sentences of "I can". Then I had them tell me in Spanish what they had written in English. 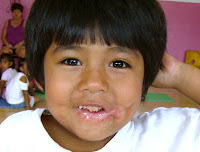 We also found out that little Fatima (burned mouth) was going to have her second operation yesterday, Saturday Oct. 1st. This operation was to cut through the scar tissue and make her little mouth bigger. This will now allow her to eat with a spoon. Praise the Lord. I can't wait to see her tomorrow. And a big thank you to Pamela Thompson for coordinating and Dr. Saldano for the surgery and covering the costs. What angels and saints we have around us. On Saturday we teach at AGAPE from 4 pm to 6 pm. We were blessed last week when a gentleman named Bob gave some brand new fans from his condo to AGAPE. So thank you David, Pamela & Freda for doing all the leg work to make sure we received them. We were surely blessed when we turned them on Saturday for our English and Bible classes. People ask me all the time what we need the most. Well it is not hard nor real costly to fill our needs. The children (boys & girls) need your prayers at both facilities. Secondarily we need volunteers to help us teach. Our schedule is not demanding. 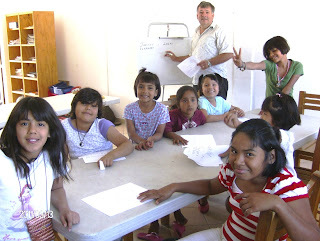 We teach Monday, Tuesday & Thursday from 11 am to 12 pm at Casa Hogar and 4 pm to 6 pm at AGAPE Home for Abused Girls. You would not believe the difference when I can take a volunteer to teach simple English like counting one to ten and also show love and interest in that child. I will guarantee once you do it you will never be the same as they will capture your heart. Call me at 322-113-0205 or see me at church and sign up there. I am only asking for a little of your time and I know for sure the Lord will bless you mightily. If your concerned you do not qualify, don't be as the only requirement is that yous speak English. We have even used Herb with His Majesty's (Queen's) English. Hehe. After one week of teaching Faye and I ended up real sick with a cold, fever and persistent cough for twelve days. Just now starting to get over it. We were so bad that the staff at both Casa Hogar Maximo Cornejo Quiroz Orphanage and the AGAPE Home for Abused Girls told us to take a week off but it ended up being two. Just a little residual cough now and started back yesterday. The children have changed (to the good) so much in the six weeks we were gone. They are taller and also sweeter than I remembered. Maybe it is distance makes the heart grow fonder. I know that both Faye and I missed our children. Faye now has about ten in her class and I have about 13 in my class. Boy, if any of you love kids please volunteer because then the kid's English really progresses. We have some new children and I need some volunteers to teach them to count to ten, then twenty and also love on them. Our schedule is really not demanding. We teach at the Orphanage on Monday, Tuesday & Thursday from 11 am to 12 pm. I am willing to provide transportation arrangements if you are willing. I guarantee you that your heart will burst from the love you receive. We are only teaching basic math (counting and a little addition and subtraction) & simple English. No Spanish is needed but you will learn Spanish as you teach English. Then on Saturday afternoon from 4 pm to 6 pm we attend the AGAPE Home and teach English and a bible story. Again you will be blessed as we invite not only the girls at the home but also the neighborhood children and also the mothers. Remember the only thing the Lord requires is for us to be available and He handles the rest. Call me at home 322-113-0205 or on my cell 044-322-123-0629. 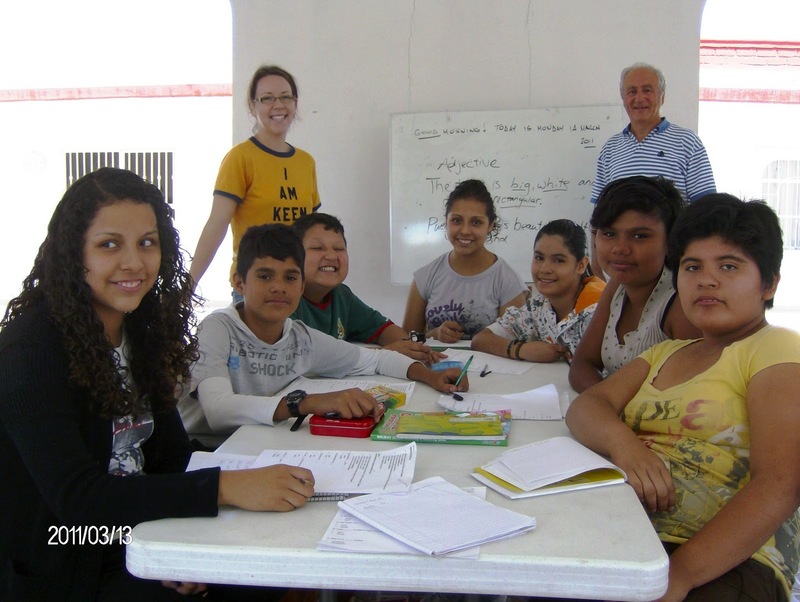 My wife Faye and I are active missionaries in Mexico, teaching English at an orphanage and a home for abused girls.